In my memories, the late 1970s – say, 1977-79 – mesh easily with the eighties, for the most part. Maybe because that’s when I started elementary school, and you begin having those shared experiences with your friends that eventually shape and define you collectively. But over the past few years, I’ve found myself drawn repeatedly to pieces from the earlier part of that decade, which I recall with little specificity, large swaths of sensory impressions, and vague memories attached to large, blurry-edged chunks of time and place. Upper Sandusky, Ohio. 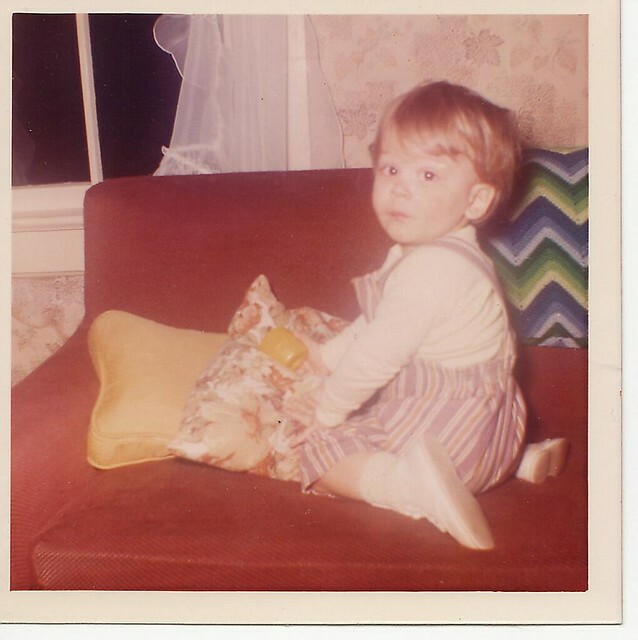 Me, sometime in 1971 or ’72. That blanket in the background now belongs to my daughter. The early 1970s were the years when my mom and I lived in her childhood farmhouse in Upper Sandusky, while my dad was serving in the Air Force; when mom & dad & I lived in Lima, Ohio, and I made my first best friend, Albert. Movies like Snoopy Come Home, Willy Wonka and the Chocolate Factory, The Towering Inferno and Earthquake take me back there in powerful, intangible ways. (Yes, I saw those last two in the theatre with my parents, and re-watched them within the last couple years for the first time in decades: Inferno totally holds up. Earthquake does not.) So do songs like Billy Don’t Be a Hero, Song Sung Blue, Bad, Bad Leroy Brown, and Band on the Run (oh God, BAND ON THE RUN). For a long time, my love for the ’80s made it easy for me to kind of file the early 1970s away in a lumped-together preschool haze of funky stripes and plaids, wavy hairstyles, and peanut butter sandwiches, without giving much thought to the lasting impressions and the things that mattered. My parents, I realize now, were at an age I’d now grin at and shake my head, saying, “Ah, they’re still just kids.” And my grandparents still had many years ahead of them – they were only about 10 years older than I am now. I’m going to try to regularly revisit those years through pictures and memories for awhile. Adam and I have talked about it occasionally, and recent conversations with my friend Mo about Walt Disney World got me looking for pieces from an early ’70s trip there with my parents. The ’80s will still be there for me. But I’m looking forward to spending some time going further back. I thought watching Footloose as a kid in the theatre was risqué. Towering Inferno? That’s huge. Can’t wait to follow THIS blog. Your picture reminds me of Sam (?) or any of those boys at age 2…I remember the afghan but can’t place the couch or house, for sure.